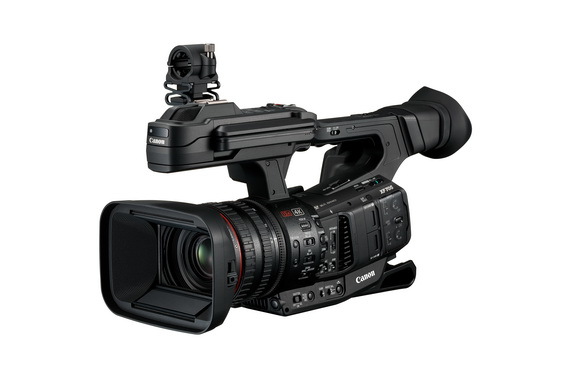 Canon today introduces the new XF405 & XF400 compact professional 4K digital camcorders that combine professional 4K image quality and flexible operability in a compact and lightweight body. XF405 & XF400 employ a 1-inch 4K UHD CMOS Image Sensor for exceptional high sensitivity and low noise performance. The camcorders are capable of recording 4K UHD (3840 x 2160) video at 50P, as well as slow motion recording up to 100P in Full HD (1920 x 1080). A 15x optical zoom lens incorporate with the Dual Pixel CMOS AF to facilitate fast and accurate autofocus. The compact and highly portable XF405 & XF400 include an HDMI 2.0 terminal to support 4K UHD output and two XLR terminals with independent audio level control. 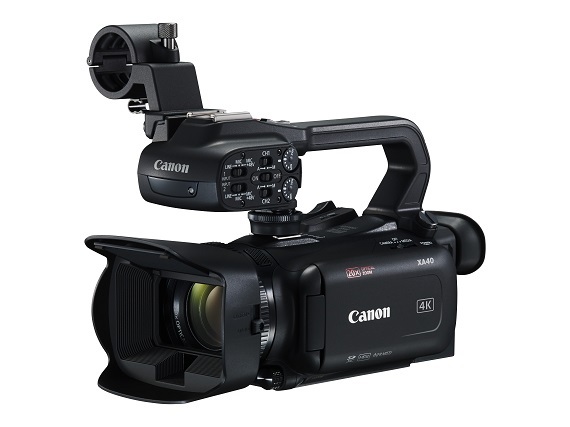 XF405 also includes a 3G-SDI output that supports camcorder integration into professional workflows. The incorporation of an adjustable 3.5-inch touch panel LCD monitor enhances usability and offers the flexibility to use in versatile applications ranging from on-location news coverage, wedding to event shooting and documentary filming. The new XF405 and XF400 support 4K UHD (3840 x 2160) 50P recording in MP4 format with up to 150Mbps recording bit rate. It retains the best possible image quality well suited for professional shooting of online videos and corporate videos and suitable for long-duration recording by using SD cards. 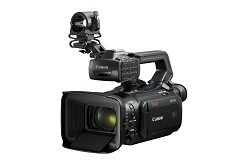 The camcorders also support high-speed recording in Full HD (1920 x 1080) at 100P in MP4 format to enable additional creative freedom for other special effects. XF405 and XF400 feature a 1-inch 4K UHD CMOS Image Sensor with 8.29-million effective pixels for 4K recording. The enhanced sensitivity and the high algorithm power of dual DIGIC DV 6 digital image processor, signal-to-noise ratio is improved when compared with its predecessor. Even when shooting with minimum brightness, the camcorders can still deliver highly detailed, sharp and smooth nighttime videos with exceptionally low level of noise. The larger sensor also exhibits a shallower depth of field at large apertures, providing greater depth of field control and creative options. XF405 & XF400 are the first ENG camcorders that featuring a built-in Dual Pixel CMOS AF which makes use of a CMOS sensor with a new structure to perform the functions of both imaging and phase-difference detection autofocus ensuring sharp images even for 4K shooting which demands extreme focusing accuracy. Users can also choose the subject for focusing with the tap of the 3.5-inch touch screen and an expanded focusing area which covers 80% of image on screen can be selected, it helps to make focusing intuitive. The camera also supports Face Detection AF function to ensure sharp capture of moving subject. XF405 & XF400 also feature the upgraded built-in Dual Pixel Focus Guide to bring a more powerful manual focus function. The screen mark can directly indicate the front focus and back focus and allow accurate manual focus to be achieved. Both camcorders incorporate Canon 25.5mm wide-angle 15x optical zoom 4K UHD video lens – a lens created with superior optical technologies from EF lens series with optimal placement of lens elements to achieve wide-angle and powerful zoom performance while maintaining a compact and lightweight design. The lens provides focal range of 25.5mm to 382.5mm1(35mm format equivalent) for more versatile imaging expressions, allowing easy capture of breathtakingly wide open scenes or close-up shots of facial expressions. Users can get up to 30x Advanced Zoom when shooting in Full HD, which extend the zoom range to 765mm. The optional 0.8x wide converter WA-U58 and 1.5x tele converter TL-U58 accessories expand the creative capabilities of the camcorders. The inclusion of Super UD (Hi Index Ultra Low Dispersion) lens, the same as found in Canon’s top-of-the-line models, reduces chromatic aberration throughout the zoom range for high resolution and low chromatic aberration images. Utilizing the superior EF lens technology, the camcorders also feature an 9-bladed circular aperture for more natural and smoother out-of-focus effect. Points of light from night city skylines can be turned into beautiful, circular blur for easy creation of cinematic bokeh effect. The lens of XF405 & XF400 is 58mm in diameter and features 3 built-in ND filters (1/4, 1/16, 1/64) for selection. XF405 & XF400 are equipped with 5-axis Dynamic Image Stabilization System for effective correction of camcorder movements across 5 axes, including tilt movements along the horizontal, vertical and lateral axis, and up-down or left-right shift movements, high level of image stability is guaranteed in all situations. Furthermore, image distortion can be substantially reduced, ensuring exceptional video performance even shooting with a handheld camcorder while walking. XF405 & XF400 incorporate dual DIGIC DV 6 digital image processors with enhanced 4K arithmetic processing capacity, capable of depicting fine details faithfully to realize sharp and true-to-life 4K videos in rich gradation. The ultra-fast algorithm power is instrumental in bringing the best out of the camcorder’s functionalities, such as the high 150Mbps recording bit rate and up to 800% wide dynamic range of Wide DR Gamma, for higher levels of image quality and performance to boost the expressive power of 4K videos. Dual DIGIC DV 6 with drastic improvement in noise reduction realizes a wider ISO range and higher sensitivity shooting. Even in dark environment where it is hard for the human eye to verify the subject, bright, low-noise and detailed shots can be taken by using only the faint ambient light, allowing for greater flexibility for night-time shooting and creation of delicate cinematic mood with dim lighting. DIGIC DV 6 is low in power consumption, enabling the camcorders to capture longer videos. Furthermore, drawing from technologies employed in Cinema EOS System, the camcorders feature the Wide DR Gamma setting that expands the dynamic range to 800%. It facilitates shooting in scenes with large lighting contrast, minimizing the occurrence of under- and over-exposed areas to maintain seamless and rich gradations from highlights to shadows. Without the need for post-production, the setting helps achieve better dynamic range right from the camcorder and preserve original colors. XF405 & XF400 are equipped with double SD card slots, support 4K UHD (3840 x 2160) and Full HD MP4 50P recording. The double SD card slots support simultaneous video recording for easy instant video backup. It also supports relay recording - a function which automatically switches to the other SD card for continuous recording when one card is full. This flexibility expands the recording capacity. The new camcorders incorporate a 3.5-inch 1.56 million-dot LCD touch panel which utilizes capacitive touch technology as found in smart phones, offering easy control by touching the screen to select focus point, perform auto-tracking, control exposure or adjust various functions settings, bringing dramatically simplified operation. When shooting in bright outdoor environment, the camcorder’s 0.24-inch 1.56 million-dot tiltable viewfinder can ensure easy checking of focus and image details for the optimal result. The viewfinder can be tilted up 60° to facilitate shooting in a confined space or from a low angle for improved operability. It also comes with a large-sized eyecup that fits snugly to the face to prevent outside light from entering to ensure viewing comfort. XF405 & XF400 come with a detachable handle to cater for different shooting needs. 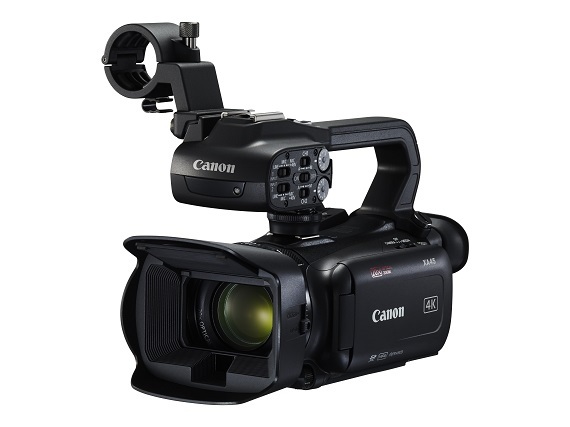 With the handle attached, the camcorders are able to shoot from any challenging angle for clear and sharp images. Meanwhile, the camcorders remain compact in size when the handle is removed, providing greater operational flexibility and making it easier to carry the camcorder around in a bag for higher mobility. In addition, 2 sets of XLR input terminals and an external microphone holder are built on the handle for attaching different professional sound recording equipment to cater for different shooting venues and needs. XLR inputs support a range of audio types, including an external line input, microphone input and microphone input with phantom power. Both recording from an external microphone and audio line input can be synchronized together for more dramatic sound effects. Volumes for the 2 channel inputs can be adjusted independently for the optimal result. Dual channel recording to serve as a backup is also supported for more reliable sound recording performance. Apart from its high shooting specification, XF405 & XF400 also feature HDMI 2.0 output terminal. XF405 further provides the 3G-SDI (embedded audio and time code) output. It can transmit directly the YCC 422 10-bit 1920 x 1080/ 50P video to post-production tools used in broadcasting industry for further editing in great convenience, bringing the exceptional HD images experience to life. Featuring an improved Infrared mode, the camcorders enable easy shooting even in ultra low-light environment and is especially useful for nighttime applications such as shooting of breaking news. Utilizing an infrared LED light offers a much wider radiation angle for even distribution throughout the entire image area, more natural looking video recording can be ensured. In addition to the default color of black and white, infrared shooting under green light is also available. XF405 & XF400 feature a built-in LAN terminal and dual bands (5GHz and 2.4GHz) Wi-Fi wireless networking function for sending signals reliably even when used in areas with increased signal interference. The Wi-Fi function supports wireless remote control of camcorder through browser on smart phones or tablet devices, without the need to install any software for enhanced shooting mobility. This allows easy shooting from more distinctive angles, for example attaching the camcorder to a crane for high angle shots or shooting from a far distance. Users can enjoy the same level of professional control on camcorder setting during remote shooting, including start/ stop buttons, Live View display, adjustments on zooming, aperture, shutter speed, exposure compensation, white balance and selections of programmed AE modes and manual or auto focusing. This brings a higher degree of freedom in filimg production. Canon’s new XF405 & XF400 compact professional 4K digital camcorders are now available for sale in Hong Kong with suggested retail price of HK$26,600 & HK$24,000 respectively. Auto / Manual; 1/6 to 1/2000 sec. * All data is based on Canon’s standard testing methods. Subject to change without notice.